There have been a lot of download game announcements for the Switch eShop in recent weeks, with Mantis Burn Racing being one in the pack; its developer VooFoo Studios may be familiar to some eShop veterans as it brought us Pure Chess on the Wii U and 3DS eShop. This latest project is a top-down racer with various single- and multiplayer options, and based upon recent social media posts the developer has aspirations to encourage more serious competitive play in the game. Keen to learn more about what the Switch version will offer later this year we caught up with Sean Walsh, Marketing & PR Manager at VooFoo Studios; we asked about the included content, modes and - naturally - the performance we can expect on Nintendo's diminutive system. 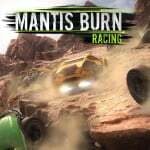 For those unfamiliar with it, can you outline the key details around Mantis Burn Racing? Mantis Burn Racing is a fun, top-down style racing game that combines real-world ‘fun’ physics with intuitive arcade racing in highly competitive, fast and frenetic races. There’s a huge selection of game modes in the game that challenge every aspect of your driving ability and allow for a quick five minute local race or hour long sessions in the 11-season long career mode. The game’s multiplayer options include 4-player local split-screen racing, a local Wi-Fi multiplayer mode and online options for up to 8 players, making it a highly social and fun game that is a great fit for Nintendo Switch gamers, on the move or at home. Starting with the Career mode, can you talk about the progression through the campaign? Can players anticipate quite a lengthy career experience? With all of the DLC packs released to date included in the Nintendo Switch version of the game, I can safely say that Switch players are getting a really extensive career experience! Standard careers are set across three difficulty levels, Rookie, Pro and Veteran, each comprising of three seasons. Add to that a stand-alone career for our super-fast ‘Elite’ hover vehicles and another for the destructive ‘Battle Cars’, and that’s over 160 events with 3 mini-challenges for each. To fully complete the campaign will take players around twenty to twenty-five hours; so there’s a lot of depth and replay-ability in the game. As the Switch edition includes all of the DLC, can you tell us how that's introduced and how it fits into the game? For example are the 'Snowbound' tracks worked into the Career mode? The ice and snow-themed ‘Snowbound’ tracks integrate into the campaign after Veteran Season 1, but can be played both locally and multiplayer from the start. 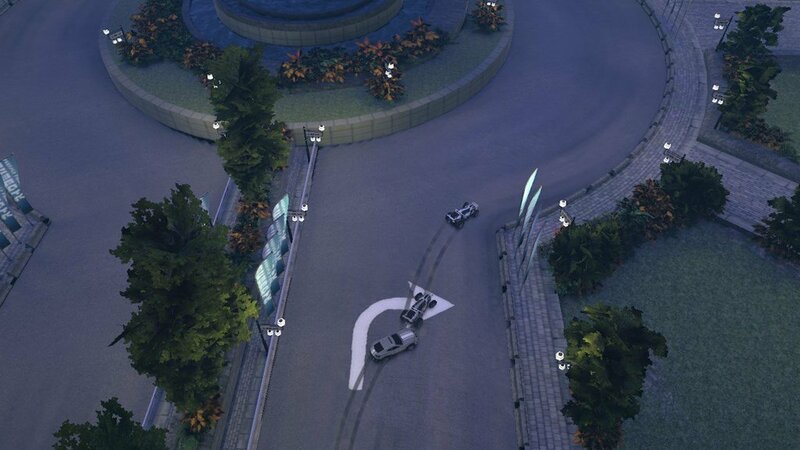 As mentioned, ‘Elite’ class vehicles and’ Battle Cars’ have their own stand-alone careers that are also available straight away, and can also be used on all tracks in all event types. 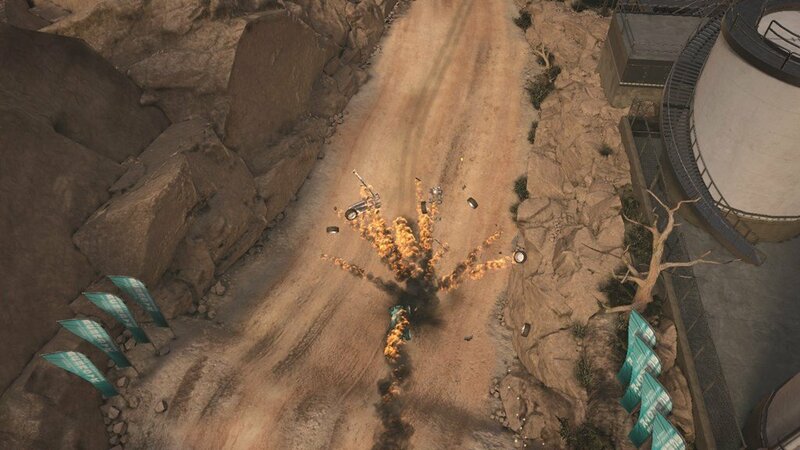 ‘Battle Cars’ also introduce their own events in ‘King of the Track’, ‘Survival’ and ‘Accumulator Rumble’. We will be supporting up to four players on a single system in local split-screen races, which is so much fun. We will also be supporting local wireless play, allowing up to eight players to race each other in the same room without the need for an internet connection. Can you outline the setup and options for jumping into online races? 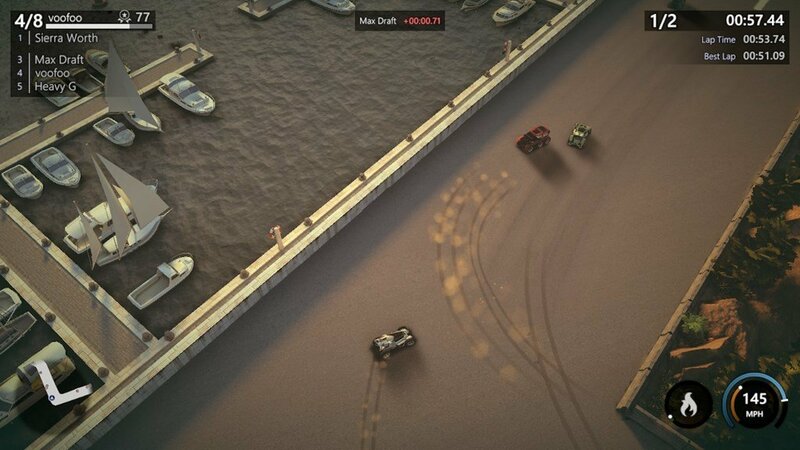 We use a very simple Lobby system that allows players as much or as little control over the racing as they desire. Hosting a lobby provides the player with a host of options from the obvious, such as track and car selection, to more fine grained choices such as the use of upgrades or to race with a level field. If you’re happy to go with the flow, just join another player's lobby and get racing within a couple of button presses. How has the development process worked out on Nintendo Switch, in terms of challenges and unique considerations when working on the system? The game was built using our own propriety game and physics engine and we’ve spent a lot of time porting this architecture to Switch, which is quite a big undertaking, as well as optimising the framerate. Of course there have been challenges, but we’re really pleased with how the game plays on Switch. As a new console, we’ve had to get to grips with new possibilities to ensure we are making best use of the Switch’s unique features. We’re really pleased to have implemented ‘cross-table’ play, which enables players to go head-to-head in 2-player local split screen races using individual Joy-Cons at opposite sides of the Switch. Players can also steer by tilting the Switch to the left and right in handheld mode, which offers a fun, intuitive way to race. Can you confirm the resolution and frame rate across docked, portable and split-screen modes? The game defaults to try and run at 60fps in all modes. However, if players prefer a consistent frame rate there is an option to lock it to 30fps and split-screen modes will always default to 30fps. In terms of resolution, we decided the best experience was achieved by offering a better frame rate and slightly dropping the resolution, which isn’t really noticeable. You have multiple titles coming to the Switch; what are the biggest factors attracting you to the system? As I mentioned earlier, we want our games to be on as many platforms as possible. We want to reach out to more and more gamers and the Switch gives us a great opportunity to do that whilst offering new, unique ways to experience our games. Of course, the Switch is going from strength to strength, which certainly makes it attractive to developers, and with Nintendo’s support for ‘Nindies’ we’re really excited that the Switch can become a lead platform for us. Do you have a final pitch for the game that you'd like to share with our readers? 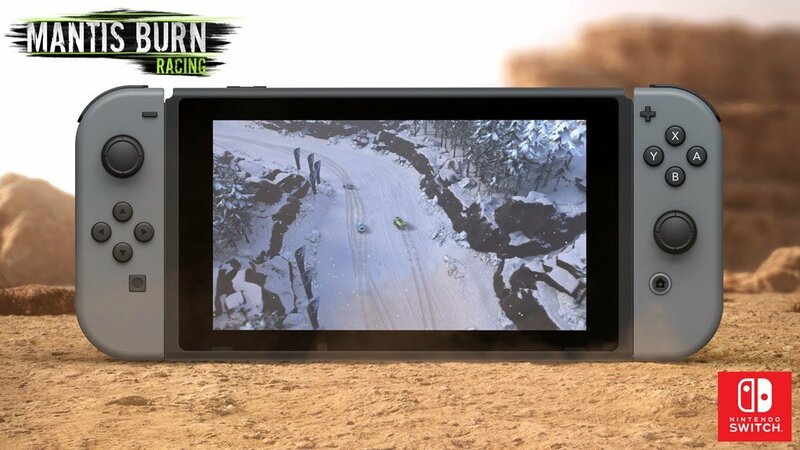 We really feel Mantis Burn Racing is a fantastic fit for the Nintendo Switch. The game has been built around addictive ‘one-more-go’ style social gameplay and a highly competitive multiplayer experience, both of which translate fantastically well to the Switch. The game looks and plays great on Switch and the reaction we’ve had to the announcement, across social media and when talking to gamers at shows like EGX, has been nothing short of amazing. There’s nothing like it currently on Switch and we’ve worked hard to give Nintendo players the chance to play the best version of the game, we can’t wait to bring classic top-down racing back to a Nintendo console! We'd like to thank Sean Walsh for his time. Switch 2 swole 2 control, yo. Perfect for that Micro-Machines itch. Not a fan of top down racers nearly as much but if it's good I will check it out. They have multiple games coming?? What ones? Can. Not. Keep. Up. With. All. The. Switch. Games! Too many I want to play. No time to play. And it can't hit stable 60 FPS? A certain purchase from me. I've heard good things about this game from my mate. No doubt someone will pick up on the framerate and resolution answer. Played 'Super Cars 2' to death on the Amiga 500 back in the day. Enjoyed 'Micro Machines' as well. Top down racers are pretty fun I recon - not sure why - I guess it makes it really satisfying when you nail a corner because you can really see the movement of the car on the road. There's also something about simplifying the view and the controls to a 2D environment that makes it feel fun - like with platformers and shoot em ups. You also get a really good view of the surrounding environment which can be used to great effect - thinking of 'Micro Machines' here of course. And shooting other cars is way easier - shooting stuff is always good. Love the enthusiasm here. Cross-table play sounds fascinating. Really enjoyed Remedy's Death Rally so this is one to watch for me, for sure. It is my kind of game. Who needs Micro Machines, eh? Sorry Codies, you've sat on the fence too long and missed the boat. @holygeez03 Most games on PS4 (a much much more powerful console) before 2017 were 30fps and now everyone expects the Switch to be 60fps for everything... It's actually been doing well with it and many games have been 60fps, which is great - but to 'expect it' for everything, seems unreasonable. It takes a lot of good coding for efficiency to get a decent game running at 60 on this hardware and not all studios have the skill/time/money to do so. As mentioned, Most games on PS4 or Xbox One are not running at 60fps and it's alot easier to do so on those consoles. "Most games".... maybe... but a small racing games like this needs to be 60 FPS... there is no excuse. And I never said I expect 60 FPS "for everything"... but for a game like this... yes. @joey302 I also want to know. @Fuz I feel the same; no money and no time but no complains. Keep it coming!! Looks a lot like Racing Gears Advance, the best racing game on Nintendo portables (excluding Mario Kart). The game has very "middle" opinions. @holygeez03 Just as a comparison - Micro machines, which is around about the same style, and graphics... but on PS4.. is 30fps. I agree it would be nice to have 60fps.. but saying there is no excuse is not neccessarily fair, given examples such as what i just mentioned. OMG! Micro Machines was one of my favorite games on NES, and this looks like the game that the latest Micro Machines on PS4 should have been! Day one purchase! Sounds promising, the only part that bothered me was that he seemed to be trying to avoid the resolution that the game will run at. Hopefully they are just finishing optimisation so they didn't have a final answer instead of performance issues. Mario Kart 8 deluxe runs at 60fps, even with 2 player split screen. I would expect this to at least match that kind of performance. This looks rather nice, but are there really no other camera angles to choose from? To me this looks a bit boring from the trailer, feels like something's missing but I can't put my finger on what. By that logic nearly every game on Switch should he 60fps. Beginning to see a trend of fan site gamers demanding perfection from every single game, without any inside knowledge or personal experience of what it takes to code on the hardware or what said game is actually capable of. There is no cookie cutter answer- Game A did this so Game B has no excuse. Never that simple. Different games run on different engines, use different lighting and shading, different coding with different approaches, different people developed it with different knowledge and skill, etc etc. And that's before making mention of the fact you're comparing an indie game up against a world class AAA developer who even built the hardware their game is running on. @JaxonH there is very little argument to suggest that this top down racer is more graphically intense than mk8d. "Being graphically intense" is only one factor in play. There are countless other variables that affect a game's ultimate performance, as I noted above. @JaxonH While I agree with you, there are other factors at play, that's almost always still a shortcoming on the developer's part or the engine itself (Which you could still blame on the dev, for choosing the wrong tool). Unity for example has been shown to struggle on Switch, for whatever reason. It could also be that the game was orginally designed for another platform, meaning optimization and performance on lower end hardware wasn't a concern at the time. Again, if you really want, you could blame that short-sightedness on the dev. Still, using MK8 as an example, I would also assume it is safe to say this game should be capable of running at 60fps. Like you said, many factors at play that we don't know about - but as consumers, if we don't know about it, we can't really comment on it. All we really know is that there are games out there that both look better and perform better. EDIT: I don't want to downplay your last point either - I agree fully the Dev's experience is a huge factor. No one is going to be better at developing and optimizing for Nintendo's hardware than Nintendo themselves. I think what MK8 and BotW accomplish on bother the Wii U and Switch prove that. So while you could blame that on the dev's lack of experience, that's an understandable excuse. @Si2k78 Please read my two comments above to another member. @JaxonH just chalk it up to lack of budget, personnel, and expertise with the switch hardware. That’s my entire point. The hardware is capable, made evident by the fact that we’ve seen better performance from more demanding games. It’s just that the devs don’t have the ability to get there most out of the hardware. @FTL Another game is only 30 FPS... so that's why it's ok for this game? That makes no sense... All that tells me is that those devs are likely even less talented or lazier if they couldn't get a game running at 60 FPS on a much more powerful system. I would be much more likely to check this game out if it was clear that the devs have the talent/skill/effort to provide a gaming experience that I feel is completely reasonable to expect. As far as I'm concerned, this appears to be a lazy effort to get a game out on the Switch and make money... but we will see when it gets released and reviewed. I see the trend to call "developers lazy" is back again. This looks awesome. Definitely a purchase for me. @kobashi100 I instantly dismiss any comment which references the 'lazy developer' trope. 1. Because it's blatently obvious they have never made and published a creative work of their own and had to rely on the income. 2. Because it's lazy thinking. 3. I'm too lazy to think of a 3rd reason. @holygeez03 Bro... that ‘other game’ is developed by one of the most talented studios in the world... running on a more powerful system. It makes sense to compare it because you said ‘no excuse’... so what i’m saying is that if a talented developer has trouble running a similar game at 60fps on a mpre powerful console... there must at least be ‘some excuse’ and leniency to releasing a 30fps game on a much lower powered system (the Switch). It makes perfect sense. Would it be nice at 60fps? of course... but should it be expected, not really. @FTL If they can't get Micro Machines to run at 60 FPS on a PS4 in 2017, then I HIGHLY doubt your claim of "one of the most talented studios in the world"... maybe some of their people are highly skilled, but the particular team that worked on that game is surely not... not even close. Perhaps it's somewhat the fault of the engine that is handcuffing them, but they chose it. @Graeme I agree - the controls were really nice. It wasn't as fast and nippy as some - Micro Machines for example - but the cars felt like they had weight and momentum. The slower pace made it better for the battling / shooting aspect I guess - it felt just right and the weapons were really nicely balanced. Great game.